Carbohydrate is arguably the most important dietary component that has the potential to improve endurance exercise performance. A diet high in carbohydrate that is consumed prior to endurance exercise increases glycogen storage in skeletal muscle and the liver, subsequently producing an ergogenic effect. In addition, carbohydrate ingestion during prolonged exercise maintains blood glucose and carbohydrate oxidation rates such that muscle and liver glycogen are spared. The improved carbohydrate availability during exercise has been shown to attenuate perceived exertion responses, especially near the end of high intensity exercise performance. Carbohydrate ingestion during exercise has also been shown to improve short-term exercise performance of 1 h or less. Carbohydrate ingested during such exercise could not reach the bloodstream in amounts needed to significantly improve carbohydrate availability. The potential mechanism of such a seemingly contradictory effect may be that the stimulation of glucose receptors in the mouth has central nervous system responses such as the activation of reward centers and an increase in central drive/motivation. Studies employing carbohydrate ingestion or mouth rinses during short-term exercise performance have reported mixed results. Nevertheless, blunted RPE and improved AR have accompanied an increased performance in some of these investigations. This chapter presents recent evidence for the ergogenic effects of carbohydrate ingestion during exercise as they pertain to perceptual and affective responses. 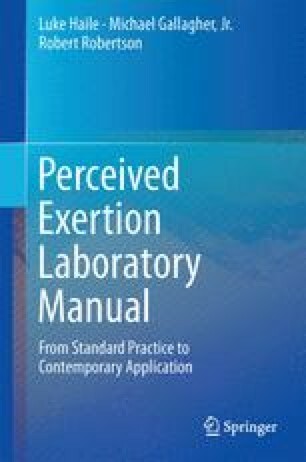 In addition, selected laboratory applications of the perceptual methodologies presented in previous chapters are again used to study the ergogenic effects of carbohydrate ingestion during exercise.